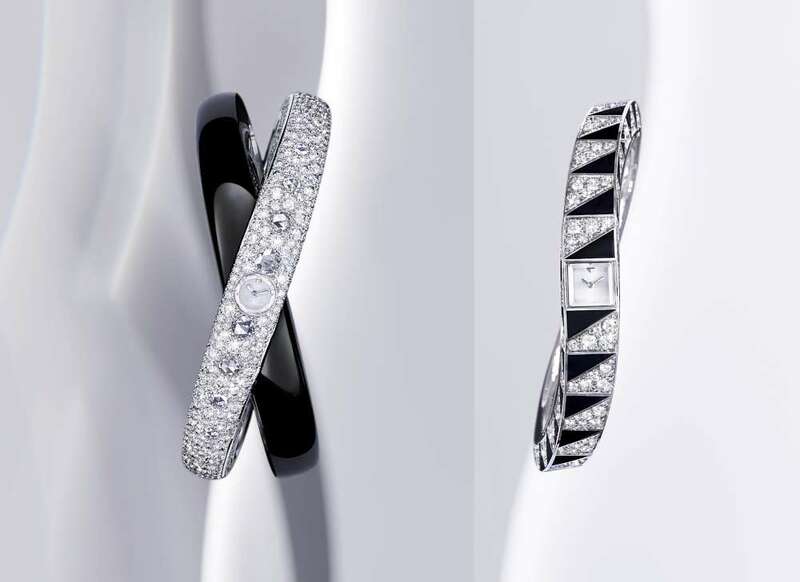 Cartier à l’infini is one of the many Cartier products that combine jewellery and watchmaking. The white gold bracelet has a subtle curve that makes the gemsetting even more complex. 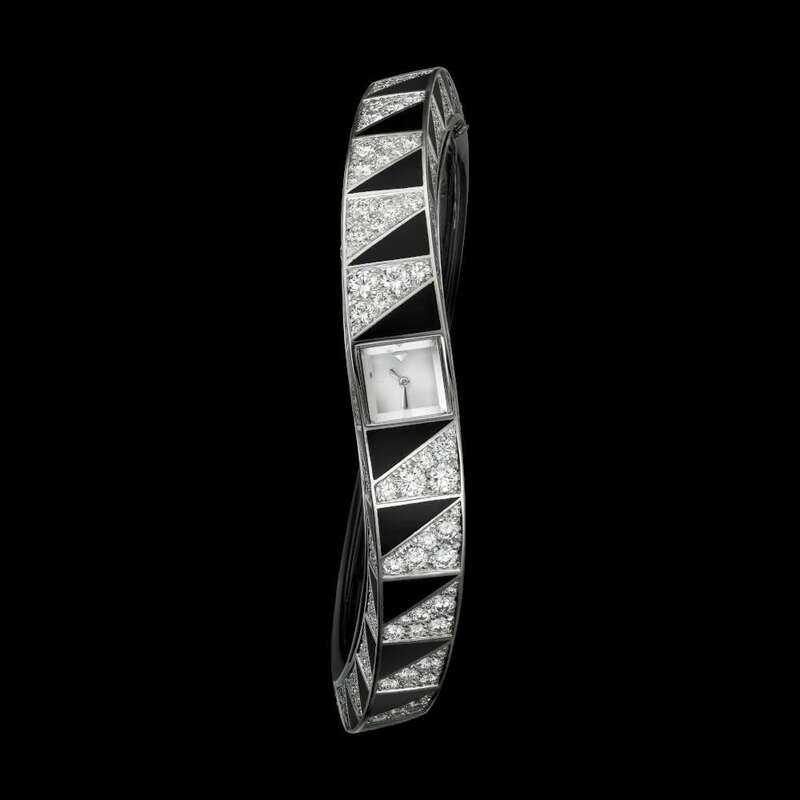 The surfaces of the top and sides of the bracelet are made in black lacquer and diamonds, creating a visually appealing frame for the tiny dial. 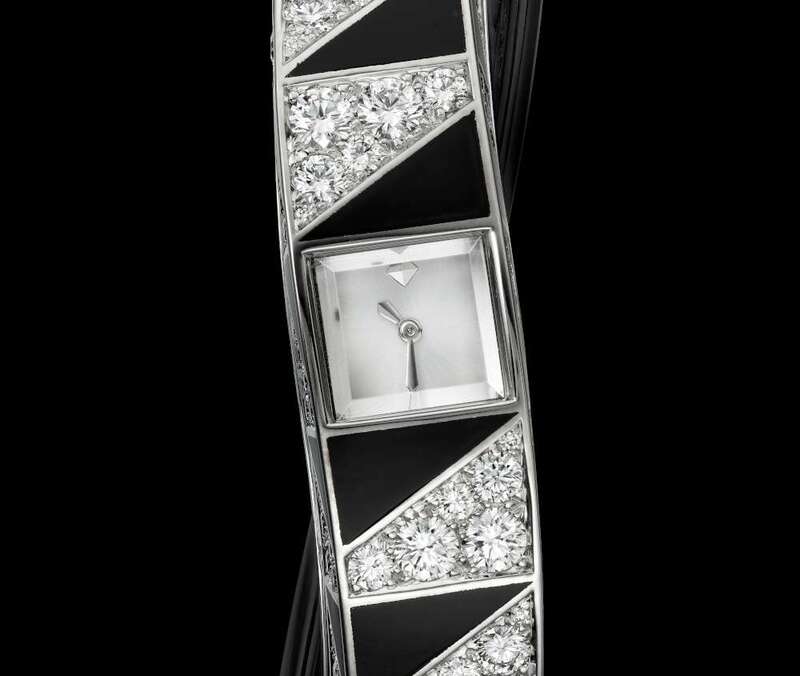 The watch is seamlessly incorporated into the bracelet, with a watchglass bevelled on the edges, a triangle at 12 o’clock, and tiny hour and minute hands. 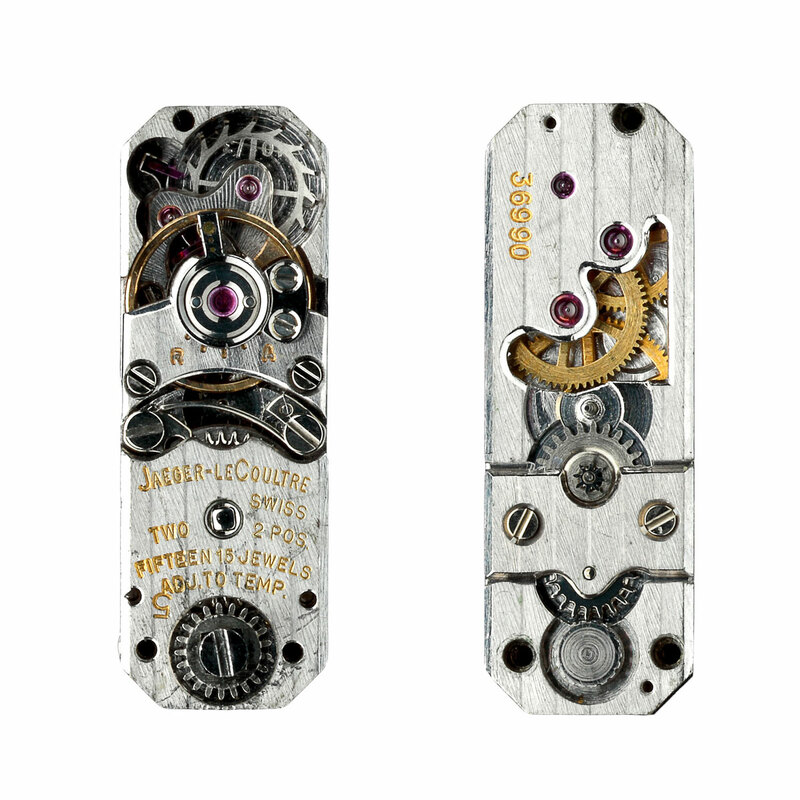 The most interesting thing about this watch is the Calibre 101 movement, made not by Cartier but by Jaeger-LeCoultre. This movement has a long history, first launched in 1929 and based on a orevious movement called the Duoplan, 1924. It’s possible that the baguette shape of Calibre 101 later inspired several inventions such as Corum’s Golden Bridge, and Freak by Ulysse Nardin. Calibre 101 contains 98 parts in a size of just 14 x 4.8 x 3.4mm. The entire movement weighs about a gram. The balance runs at 21,600 vibrations per hour (3 Hertz), and the hand-wound movement has a power reserve of 33 hours. What’s surprising is that those few miniature jewellery watches made every year incorporate the Calibre 101 – nothing has ever been built to replace it. Cartier and Jaeger-LeCoultre both belong to the Richemont Group and so it’s not surprising that the former company can have access to these super-specialized movements that only a few watchmakers at Jaeger-LeCoultre are capable of making. All parts have to be individually hand-finished, and production is probably limited to a few dozen per year just because of its technical complexity. Calibre 101 also appears in a one-off Cartier watch called Rings of Saturn, a combination of two intersecting rings, one in black jade, and one with brilliant-cut and rose-cut diamonds set into white gold. In this piece (on the left in the photo below) the watchglass is faceted on the sides to emulate the cut of gemstones. The reference to Saturn provides a contrast between the vast dimensions of the universe and the tiny dimensions of this timepiece. 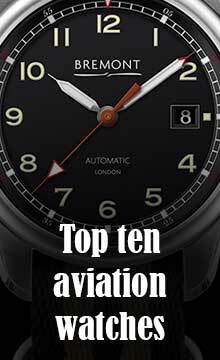 The jewellery craftsmanship is superb, but again the surprise is the Calibre 101, which after 87 years of service, is still the smallest mechanical watch movement ever made. Read more about Cartier on the company website.